Weaning has now started for this year – W.P-B.R. Tresorya Huckleberry and Tresorya Dancing Lord were weaned first, and followed today by Tresorya Golden Glow, W.P-B.R. Tresorya Cornish Legend, W.P-B.R. Tresorya Phoenix and W.P-B.R. Tresorya Halley’s Comet. All are settling well and some will soon be on their way to new homes. 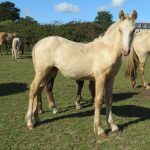 Smart Buckskin Welsh Cob Section D Yearling Tresorya Caramac will soon be going to a lovely new family home. 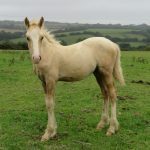 He is by Cremello Stallion Tresorya Cornish Cream and out of Talebolion Catia by Supreme Champion Hwylog Diplomat. 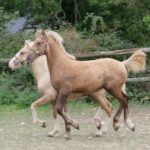 He is such a sweet colt – a friend too! 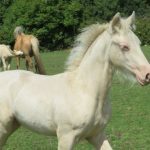 We are delighted to know that cremello colt W.P-B.R. 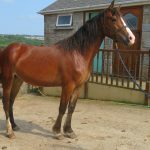 Tresorya Halley’s Comet will be going to a lovely new home after weaning. He is growing well and such a friendly character. 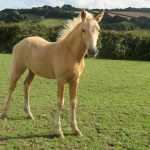 Today we said Goodbye to Tresorya Nara Lwyd, a very smart 2 year old Full Welsh D filly, which is going to mature to a good height! She travelled well and is now enjoying her lovely home with new owner Kathryn. We wish both Kathryn and Nara a great future together! 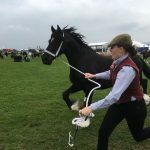 TRESORYA WELSH COBS IS NOW ON FACEBOOK! At long last after many enquiries Elizabeth Trenerry ( Tresorya Welsh Cobs ) and TRESORYA WELSH COBS are now on Facebook. I am still in the process of setting things up, so please may I ask you to be patient with me! Thank you. I hope to master it as soon as possible!!! 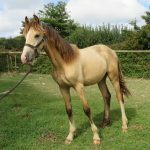 A very exciting day today at Tresorya as we welcome the arrival of a very pretty buckskin filly Tresorya Heidi. Her Sire is Tresorya Cornish Cream and her Dam Tresorya Hywela. Derwen, Nebo and Parc Bloodlines with another lovely head! 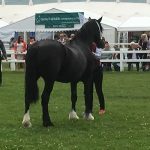 TRESORYA CYNFAEL WINS HIS CLASS TODAY AT THE ROYAL CORNWALL SHOW – CONGRATULATIONS!!!!! A very exciting day today !!! 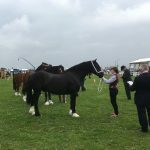 – Fortunately I was at the Royal Cornwall Show and able to join in the celebrations when black gelding Tresorya Cynfael now owned by Kirsty Sherriff won the open barren mare and gelding class. There was good competition and a very proud moment for us all!! He has been produced well by Kirsty along with Zoe ( photo below ) who showed him today. Congratulations!!! 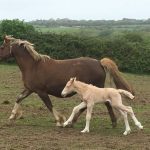 LOOK WHO HAS ARRIVED THIS MORNING – A VERY SMART CREMELLO COLT! 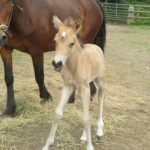 Great excitement at Tresorya again today as we welcome the arrival of a Cremello Colt! The Sire is Cremello W.P-B.R. 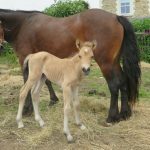 Tresorya Gwynhaf Llawen , now at a stud in Switzerland, and out of Palomino W.P-B.R. Tresorya Hafwen. 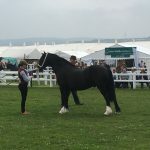 The colt will be offered for sale and photos will be on the website very soon. 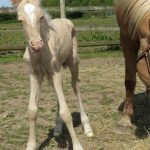 LOOKS AS THOUGH WE HAVE ANOTHER SMART PALOMINO COLT – VERY CREAM, BUT DON’T THINK IT IS CREMELLO? Last night saw the arrival of another smart Full Section D colt. It appears to be palomino, although it’s body is very cream. Time will tell! 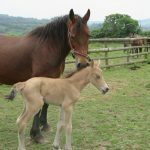 He is very smart and by Tresorya Cornish Cream and out of palomino maiden mare Tresorya Gwyddfid Gwrol. It has a blaze and 4 whites. Photos will be on the website very soon. Name to be decided and he will be offered for sale to a lovely new home. Am having a very hectic time at the moment, so have not had time to update the website. 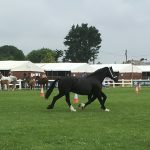 I will try to get photos of foals on the website asap. My apologies.